it is evident that he has not acquired this knowledge by studying and that it is a grace and gift of Allah to him. Think of a person. He is illiterate but he is among the scientists who have mastered physics. He confirms them regarding the issues that they unanimously agree by saying, “You are right.” However, he opposes them regarding the issues that they disagree, corrects their mistakes and shows them the truth. The knowledge of the person who does it has not been acquired by reading but it is a divine gift. There is no doubt about it. He cannot read and write; that is, he is illiterate. He is among Jewish and Christian scholars who have studied religion. There are also idolaters who believe in Allah but use idols as means of approaching Allah. 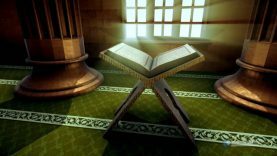 He confirms them related to the issues that they agree like the existence of Allah, Paradise, Hell, angels and prophets. He guides them and shows the truth related to the issues that they disagree like whether Hz. Isa (Jesus) is a prophet or not, Hz. Maryam (Mary) is innocent or not and what Allah’s names and attributes are. Is it possible for an illiterate person to do it on his own? Does this state of his not show that the knowledge given to him is a divine grace? Does this knowledge, which is a divine grace, prove his prophethood? Belief in the Messenger of Allah # 2 CAN A PERSON WHO IS NOT A PROPHET IMITATE A PROPHET?